New Haven, Conn. – Buoyed by a $3 million federal grant, a Yale University-led experiment will explore key questions about the tiny particles called neutrinos — and potentially improve the way we monitor and safeguard nuclear reactors in the process. The U.S. Department of Energy grant from the Office of High Energy Physics will be used to build a first-of-its-kind, short-distance detection device for the Precision Oscillation and Spectrum Experiment (PROSPECT), a project involving 68 scientists and engineers from 10 universities and four national laboratories. The detection instrument will be constructed at Yale's newly renovated Wright Laboratory and later be deployed at the High Flux Isotope Reactor at Oak Ridge National Laboratory, in Tennessee. The PROSPECT experiment has been in development for more than three years. "It's an excellent marriage of fundamental science and potential applications," said Karsten Heeger, a Yale physicist, director of Wright Lab, and principal investigator for PROSPECT. "We want to better understand the emission of neutrinos from a reactor and study the fundamental properties of elementary particles. By going very close to a research reactor — less than 10 meters from the reactor core — PROSPECT will have unparalleled sensitivity to study the energy distribution of neutrinos as they leave the reactor." "PROSPECT represents almost four years of dedicated research and development by our team of national laboratories and universities," said Nathaniel Bowden, co-spokesperson for PROSPECT and a physicist at Lawrence Livermore National Laboratory. "Drawing on our extensive expertise in neutrino physics, liquid scintillator development, and reactor monitoring applications, PROSPECT has a mature, construction-ready system design that will result in a world-leading measurement." A great deal of scientific research is currently focused on neutrinos, which are subatomic particles that move through the universe with almost no mass and no electrical charge. Incredibly difficult to detect, neutrinos' properties and behavior may hold answers to fundamental questions about the nature of matter in the universe. One such property is oscillation — neutrinos' ability to change among three known types, or "flavors." The discovery of this process, in 1998, was recognized with the 2015 Nobel Prize in physics and the 2016 Breakthrough Prize. Part of its significance comes from the glimpse it gives scientists into the possible existence of matter beyond the parameters of the Standard Model of Particle Physics. One way scientists are studying neutrino oscillation is by detecting neutrinos created within nuclear reactors, such as the Daya Bay Nuclear Power Plant in China. The Daya Bay experiment recently found that fewer antineutrinos were being emitted than physicists had predicted. PROSPECT, by moving closer to a reactor core, will try to find out why. "Previous neutrino detectors have gone deep underground, to reduce interference from cosmogenic backgrounds," said PROSPECT co-spokesperson H. Pieter Mumm, of the National Institute of Standards and Technology. "PROSPECT will, for the first time, make a precision measurement of reactor antineutrinos with a detector operating at the Earth's surface, something never before accomplished. Such a demonstration could open up new opportunities for neutrino physics and nuclear safeguards." The successful operation of a relatively compact neutrino detector on the surface would demonstrate a way to remotely monitor nuclear reactors via the detected neutrino flux. PROSPECT also will search for "sterile" neutrinos. These are hypothesized particles — a fourth type of neutrino — that interact outside of the existing parameters of the Standard Model of Particle Physics. Sterile neutrinos would represent a new form of matter and could explain the observed deficit of reactor neutrinos in Daya Bay and other experiments. Heeger noted the experiment's potential, adding, "PROSPECT addresses one of the outstanding puzzles in the field of neutrino physics and has the potential for a paradigm-changing discovery in particle physics." Additional collaborators on PROSPECT include Brookhaven National Laboratory, Drexel University, Georgia Institute of Technology, Illinois Institute of Technology, Le Moyne College, the University of Tennessee-Knoxville, Temple University, the University of Waterloo, the College of William and Mary, and the University of Wisconsin-Madison. 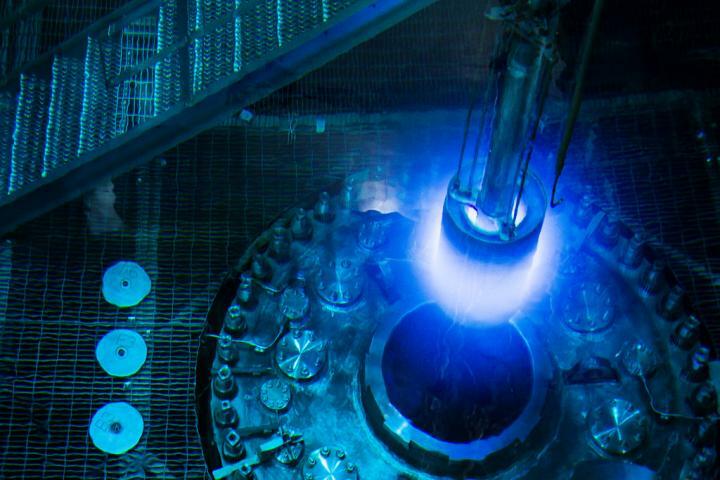 The High Flux Isotope Reactor at Oak Ridge National Laboratory is operated with funding from the U.S. Department of Energy's Office of Science, Office of Basic Energy Sciences. For Yale and the Wright Lab, PROSPECT also symbolizes a new focus on designing and building instruments for innovative physics experiments in specialized settings — from inside nuclear reactors to the temperature extremes of the South Pole. Yale's PROSPECT team includes Heeger; research scientists Henry Band, James Nikkel, and Tom Wise; postdoctoral researcher Tom Langford; graduate students Danielle Norcini and Jeremy Gaison; and technical staff members Jeff Ashenfelter and Frank Lopez.